The Donut Directory: Captain America Donuts! I hope the 4th of July was full of fireworks, family, friends and of course donuts! Having just returned from my 4th of July respite, I'm happy to report that my holiday was filled with all of the above; I have a singed thumb to prove it. As I have relayed before I'm normally not one to partake in "chain donut" fare, nor is the intention of this site to promote the large national chain products but, as I do often on the road and will grab a coffee from Dunkin, and they are the only large national chain I can identify which still has some individual outlets, 36 out of the 2100 locations in New England, that make fresh donuts on location (one being in Weymouth, MA), I'm happy to occasionally make note when they come out with something interesting; a la Captain America . 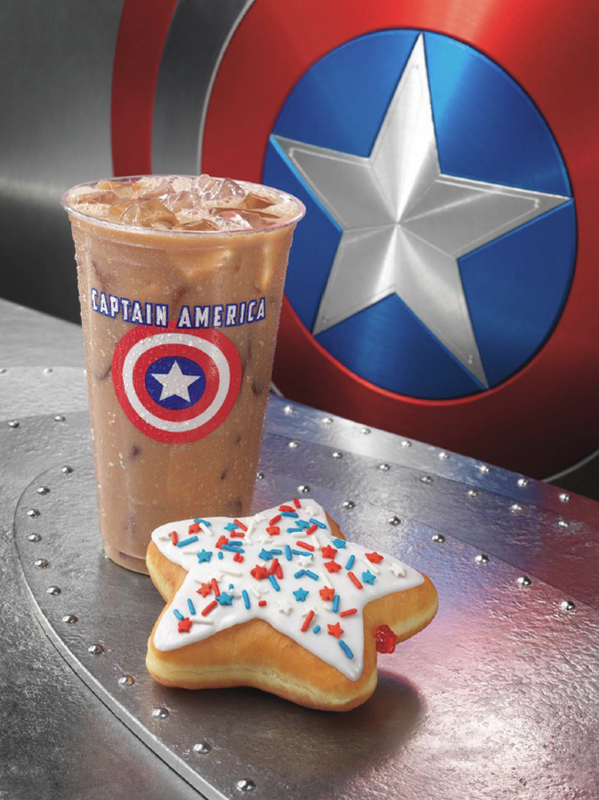 Dunkin Donuts recently announced the brand’s first-ever movie partnership, its multi-product line of Captain America consumables. In support of the Marvel Studios film Captain America: The First Avenger, the brand has followed a patriotic theme in the creation of these three new products. The Captain America Coolatta, is a cherry-flavored frozen beverage that comes in a special limited-edition collectible First Avenger Tri-Cup, an interesting three-chamber cup that allows you to fill up on three different Coolatta flavors within the same cup. Also part of the lineup is a Captain America Donut, the brand’s first-ever star-shaped donut, and a Stars & Stripes Donut, both topped with patriotic red, white and blue sprinkles.